Gloria Commons is an active adult community in Milford, Connecticut. The community includes 50 attached homes and greenbelts maintained by a homeowners’ association (HOA). Residents are a short drive from golf courses, the beach, and everyday conveniences. A clubhouse provides a multi-purpose room for residents to meet for activities or host social activities. Trees and greenbelts surround this quiet enclave. Construction on Gloria Commons began in 2007 and concluded in 2015 with 50 attached homes. These homes range in size from 1,955 to 2,550 square feet and have two or three bedrooms, two or three bathrooms, and an attached one or two-car garage. Features in some homes include gas fireplaces, granite countertops, and oak cabinetry. Residents can relax since the HOA provides lawn care, snow removal, and exterior home maintenance. A low-maintenance lifestyle gives homeowners more freedom to socialize with neighbors, spend time on hobbies, or travel. Gloria Commons is conveniently located close to grocery stores, pharmacies, and shopping centers. Golfers have several great courses to choose from in the area, including Grassy Hill Country Club, Great River Golf Club, and Short Beach Golf Course. Silver Sands State Park offers fishing, swimming, and a boardwalk along the shores of Long Island Sound. New Haven is only a half-hour drive away away, where residents can visit the Peabody Museum of Natural History or Yale University Art Gallery. New York City is a train ride away. 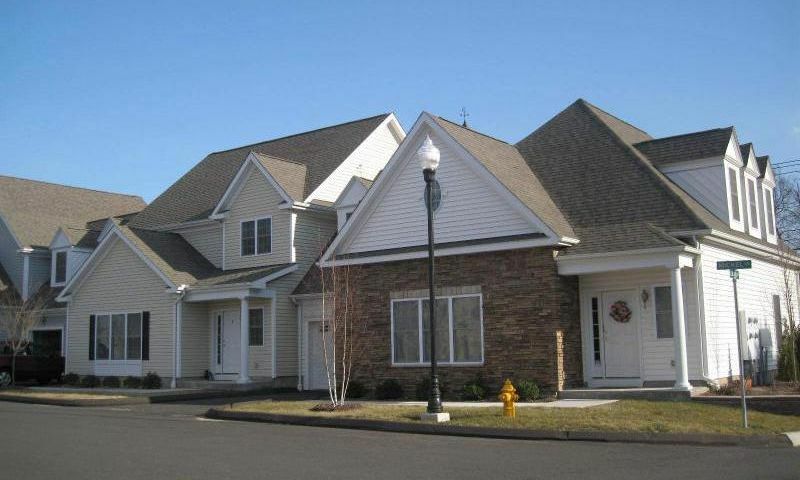 Active adults looking for a low-maintenance lifestyle in a great location will find just what they’re looking for at Gloria Commons in Milford, CT. Check back soon for more information on the lifestyle in Gloria Commons. Construction on Gloria Commons began in 2007 and concluded in 2015 with 50 attached homes. These homes range in size from 1,955 to 2,550 square feet and have two or three bedrooms, two or three bathrooms, and an attached one or two-car garage. Features in some homes include gas fireplaces, granite countertops, and oak cabinetry. Please Note: Floor plans are not available at this time. 55places.com is not affiliated with the developer(s) or homeowners association of Gloria Commons. The information you submit is distributed to a 55places.com Partner Agent, who is a licensed real estate agent. The information regarding Gloria Commons has not been verified or approved by the developer or homeowners association. Please verify all information prior to purchasing. 55places.com is not responsible for any errors regarding the information displayed on this website.